ASHTON, W.Va. — You have to start somewhere. The Wahama volleyball team began the 2017 campaign on a victorious note Wednesday following a 25-10, 25-15, 25-13 decision over host Hannan in the season opener for both Mason County programs. The Lady Falcons (1-0) trailed in all three games, but the guests rallied back in each of those contests en route to claiming double-digit wins while posting an evening sweep of the Lady ‘Cats (0-1) — who finished the 2016 season winless in 22 matches. There were 12 lead changes and nine ties overall, and WHS claimed early leads in each of the first two games while building up a 2-0 match advantage. In the finale, however, HHS trailed only once until Wahama broke a 12-all tie by scoring 13 of the final 14 points while wrapping up the straight-game decision. It wasn’t perfect, but it was a good start for the Lady Falcons — who mustered only two wins just a year ago. Afterwards, WHS coach Matt VanMeter spoke about the course of the evening. It was also a bit of a learning experience for Hannan first-year coach Dave Jordan, who was a late addition to the squad after Kellie Thomas had to resign the head position because she is also employed in the fall season as the football trainer. Jordan, however, was pleased with some of the things he saw. Wahama stormed out to an early 3-0 cushion in the opener, but the hosts rallied to take leads after tying the game at three, four, five and six-all. Gracie VanMeter, however, served up eight straight points for a 15-6 WHS advantage — and the guests never looked back. The Red and White scored 10 of the final 14 points en route to a 15-point win and a 1-0 match lead. 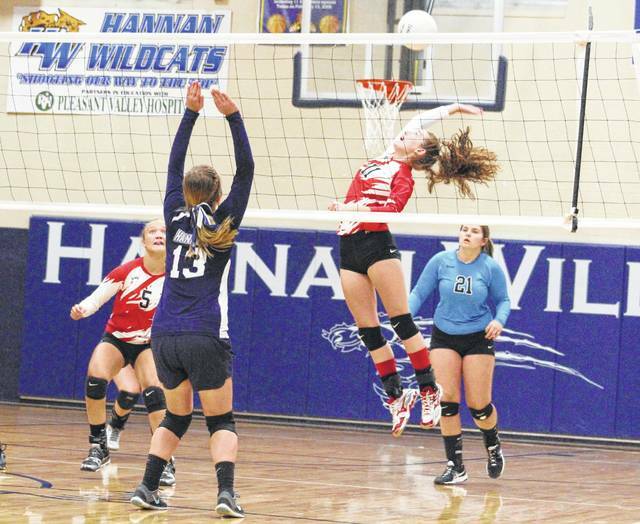 Hannan’s only Game 2 lead came with the first point, but the Lady Falcons followed with five straight points — resulting in a lead they never relinquished. The Lady ‘Cats closed back to within 11-10, but the guests reeled off 14 of the final 19 points while claiming a 10-point win and a 2-0 match advantage. HHS led 3-0 and Wahama countered with a 5-4 edge early in Game 3 before both teams found themselves tied at five. Hannan again led by three points (10-7) before WHS rallied to knot things up at 11, then the hosts took their final lead of the match 12-11. The Red and White broke serve for a 12-all tie, then MaKinley Bumgarner served up six straight points to give Wahama an 18-12 cushion. The Lady Cats closed to within five by breaking serve, but the guests scored the final seven points of the finale to complete the triumph. Madison VanMeter and Victoria VanMatre paced the Lady Falcons with 10 service points apiece, followed by Bumgarner, Gracie VanMeter and Elizabeth Mullins with eight points each. Hannah Billups was next with seven points, while Harley Roush and Alexis Mick respectively added three points and one point for the victors. Mick, Madison VanMeter and Gracie VanMeter led the WHS net attack with two kills apiece, followed by Bumgarner, Billups and Lexi Layne with a kill each. Josie McCoy paced Hannan with seven service points, followed by Kassidee Bush with six points and Jessica Dalton with two points. 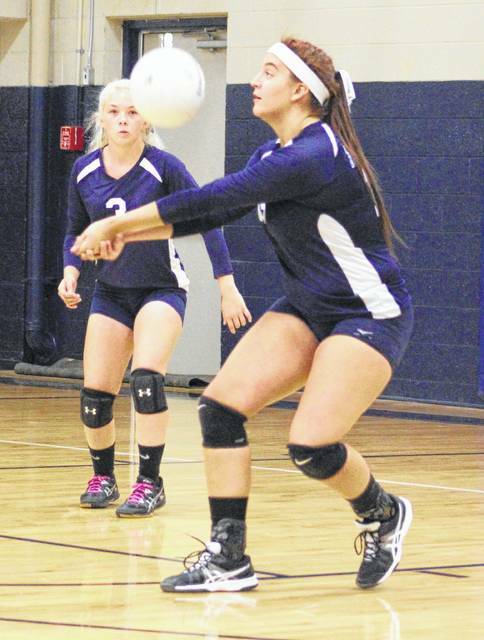 Cassidy Duffer and McKenzie McQueen also had a service point each in the setback. Bush had a single kill for the Lady ‘Cats, their lone successful spike of the match. Wahama opens Tri-Valley Conference Hocking Division play on Wednesday when it hosts Trimble at 6 p.m.
Hannan returns to action Tuesday when it hosts Ohio Valley Christian at 6 p.m.
Wahama junior Hannah Billups (11) leaps for a spike attempt during Game 1 of Wednesday’s season opening volleyball match against Hannan in Ashton, W.Va.
Hannan senior Kassidee Bush, right, bumps a ball in the air during Game 2 of Wednesday’s season opening volleyball match against Wahama in Ashton, W.Va.